Bat rays (Myliobatis californica) are a key predator along the coast of California and Oregon. They can grow to six feet wide and weigh as much as 200 pounds, though most rays are smaller than this. The largest ray caught off the coast of California was recorded at 181 pounds. These fish eat a variety of foods including mollusks (like abalone and clams), invertebrates (like crabs), and some smaller fishes. They dig up clams by flapping their pectoral fins, which look like wings, to create suction, and then rooting in the sand with their snouts. Rays crush the clams whole, grinding the shells with their teeth. Like sharks, they continuously grow new teeth, so breaking a tooth on a clam is a risk they can take. 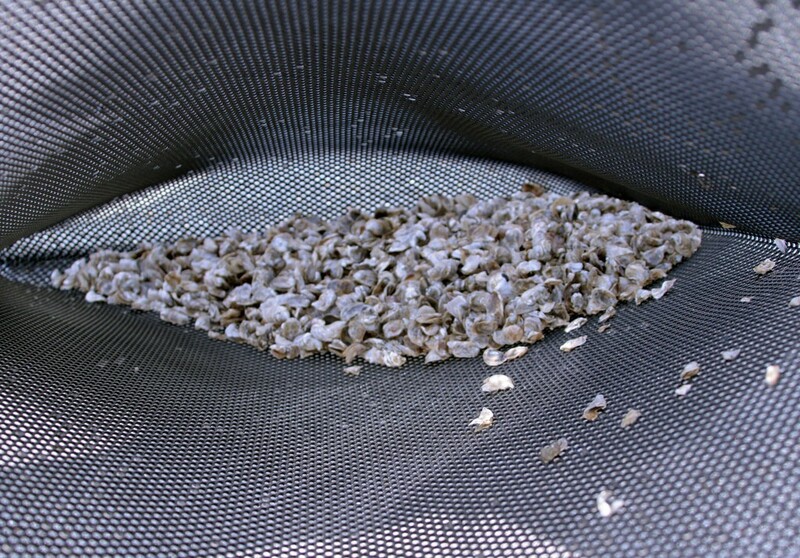 This photograph from the U.S. Army Corps of Engineers shows 1,000 baby oysters (called spat) inside a mesh bag that protects them from predators. Bat rays live in water waters as deep as 150 feet, but can also be found near the surface. During the spring and summer, they breed in California’s shallow sloughs and bays. The babies are born live, stinger first, with their wings wrapped around them. At birth, their stingers have a protective sheath that quickly sloughs off. The stinger becomes stiff and can be used for self-protection within a few days. 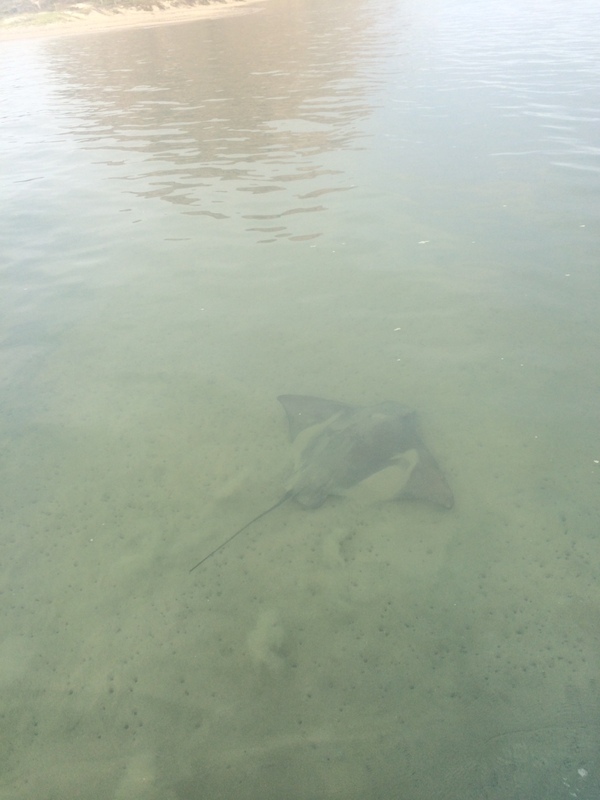 Locally, many paddlers report seeing bat rays—including mother and baby rays—near Sharks Inlet in the back bay. Bat rays can also be seen near the harbor mouth. (We’ve watched full-grown rays swim by below the Morro Bay Estuary Nature Center’s windows, close to the water’s surface.) They move gracefully and quickly, curling and flapping their wings as they go. 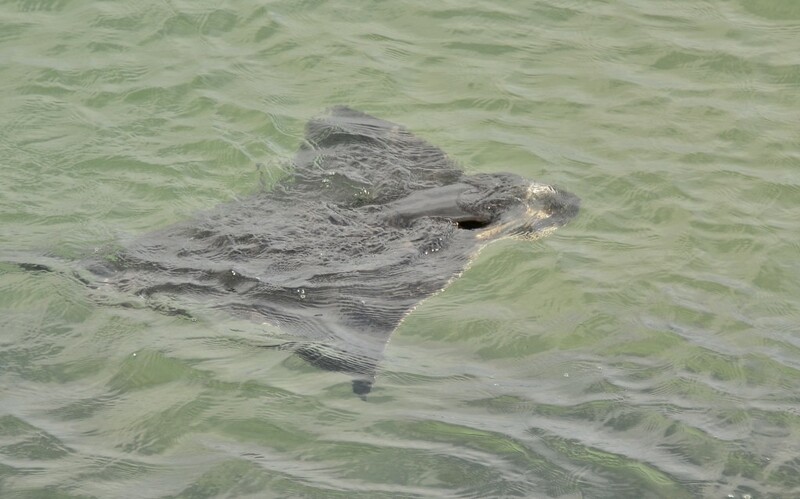 This bat ray was photographed by Linda Tanner near Target Rock. Bat rays sometimes bury themselves in the sand with only their eyes showing. This protective camouflage helps to keep them safe from predators like sea lions and sharks. To keep bat rays safe from your feet—and your feet safe from bat rays’ stingers—it’s best to shuffle when walking in the shallows along the sandy bottom of the bay. Estuary Program Monitoring staff got a good view of this bat ray partially buried in the sand while they were monitoring eelgrass beds.